The OMR-only OpScan 4ES delivers 2800 sheets per hour throughput in a convenient desktop size. The OpScan 4ES scanner is easy to operate and reads pencil marks from an OMR form. Messages are provided on a forty-character display to simplify operation. An open feed path provides sheet visibility at all times as well as easy access for sheet removal and transport cleaning. Scanner self-diagnostics quickly pinpoint any operating problems. Software applications developed for the OpScan 2/3/4/4U and ScanMark™ ES 2010, 2260, and 2800 scanners are plug-and-play compatible with the OpScan 4ES scanner. The OpScan 4ES with SefScore includes a Scantron Score emulator to support scanning Test Scoring machine forms. The OpScan 4ES scanner is accurate, fast and efficient, giving you the most precise and effective data available. The scanner has a form throughput rate of up to 2,800 sheets per hour and a fixed, automatic feed hopper holds 100 sheets; helping eliminate continual form reloading and constant operator attention. Using continuous self diagnostics, the OpScan 4ES alerts you when it detects conditions that may affect data accuracy. 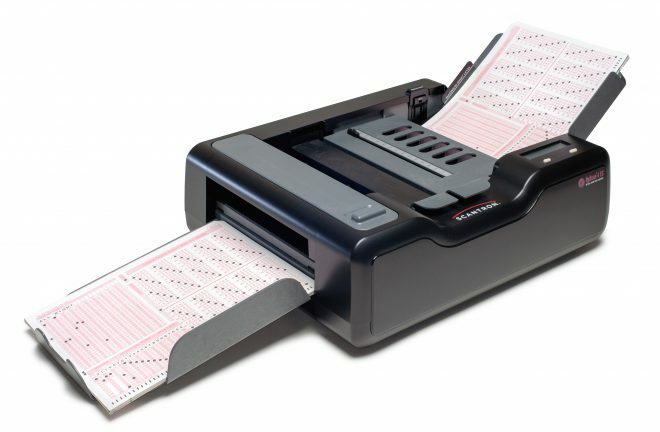 The scanner’s sheet thickness detector helps ensure the scanner reads only one sheet at a time and the sheet-skew detection helps ensure proper registration while scanning. The OpScan 4ES is energy efficient and reduces power consumption when not in use. Communications USB 2.0, using a virtual serial port with user-defined protocol. Operation Read Heads: Contact Image Sensor Arrays, 16 level OMR, Pencil Read Capabilities.